Luke Glendening unexpectedly will be with the Red Wings in Ann Arbor on Wednesday. Luke Glendening is apparently not done playing outdoor games. Glendening, a veteran of three outdoor games from his time with the Michigan Wolverines, played in Monday night’s AHL matchup between the Grand Rapids Griffins and Toronto Marlies, scoring two goals, at Comerica Park. After the game, Glendening was asked about playing at Michigan Stadium in the Winter Classic and said he didn’t expect to play with the return of Darren Helm. That all changed when he left ballpark. "I was driving home with my mom and got a call from (Griffins coach Jeff) Blashill that I needed to be here by 11 today," Glendening said. "I was planning on watching this one on TV, excited to see how it turned out. Now that I have the opportunity to be a part of it, Iâm excited." Red Wings general manager Ken Holland said they sent Tomas Jurco down and recalled Glendening for a specific reason. "Towards end of the game last night, Mike (Babcock) put Z (Henrik Zetterbert) and Pav (Pavel Datsyuk) together, and if we put Z and Pav together, we need another center iceman, so having Glendening in the lineup gives coaches flexibility because we got Helm, (Joakim) Andersson, Glendening," Holland said. "Glendening can play right wing if he has to." Glendening made it to Ann Arbor to practice with the Wings in a familiar environment. 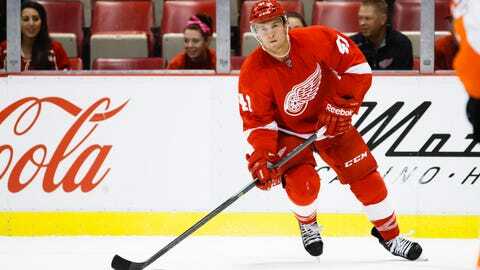 "To be back in Ann Arbor is fun for me," Glendening said. "Itâs a little overwhelming, but Iâm just trying to take it all in and enjoy it. "The fact that I went here and played a game here, at the Big House before, all of that culminates together and makes it extra special."